Overall Condition Good. Some of our beads have traveled at least three continents, and have graced numerous owners. Small chips, corrosion, and pitting are a normal part of their patina attesting to their age and extensive use. Damage/Repair Pitting and wear on some beads. Bead Size 2-6mm dia. See picture with penny for size comparison. Picture is an example. Yours will be very similar. Bell color may vary from brass to silver. 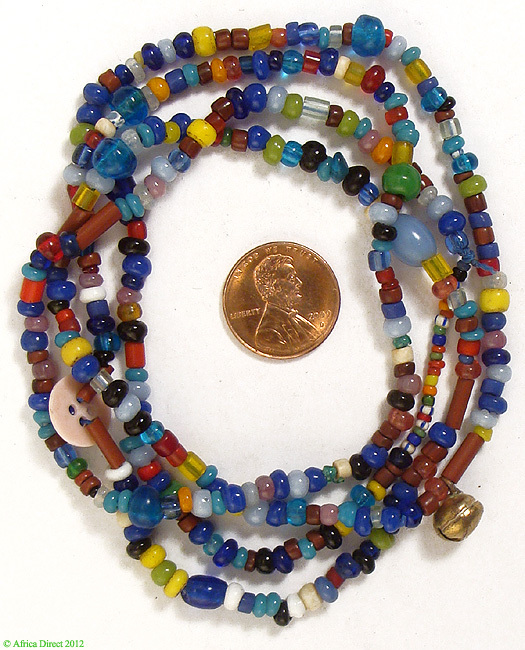 Additional information: "Treasure necklaces" like these were made from a mix of European glass trade beads, brass rings, bells and more. They were most common in East Asian countries like Burma and Thailand.